Will the congregation receive a benediction? 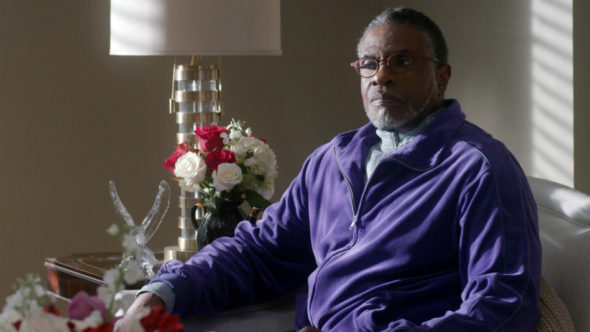 Has the Greenleaf TV show been cancelled or renewed for a third season on OWN? The television vulture is watching all the latest cancellation and renewal news, so this page is the place to track the status of Greenleaf season three. Bookmark it, or subscribe for the latest updates. Remember, the television vulture is watching your shows. Are you? Airing on the OWN cable channel, Greenleaf stars Keith David, Lynn Whitfield, Lamman Rucker, Kim Hawthorne, Lovie Simone, Merle Dandridge, Desiree Ross, Deborah Joy Winans, Tye White, GregAlan Williams, Benjamin Patterson, Anna Diop, and Terri J. Vaughn. Oprah Winfrey recurs. The drama explores the unscrupulous world of the Greenleaf family and their sprawling Memphis megachurch. Scandalous secrets and lies are as numerous as the faithful. The second season of Greenleaf averaged a 0.37 rating in the 18-49 demographic with 1.41 million viewers. Compared to season one, that’s down by 40% in the demo and down by 33% in viewership. Learn how Greenleaf stacks up against other OWN TV shows. On August 7, 2017, Greenleaf was renewed for a third season which will debut August 28, 2018. Stay tuned for further updates. Season two premiered with mediocre ratings for an OWN show and they’ve dropped quite a bit. Though they could cancel it, my gut tells me OWN will renew Greenleaf for a third season. The show has good buzz and the network’s namesake — Oprah Winfrey herself — recurs on the series. For now, I’ll look elsewhere for my supper, but I’ll still keep an eye on the ratings. Subscribe to stay up-to-date on Greenleaf cancellation and renewal news. 8/7 update: Greenleaf is renewed for season three on OWN. Details here. What do you think? Are you happy the Greenleaf TV show was renewed for a third season? How would you feel, had OWN cancelled this TV show, instead? I LOVE this show. All of the characters are so realistic. The lines are real. The happenings are true to life. DO NOT CANCEL THIS SHOW, it’s part of my life! Love Green leaf. Exactly show, keeps you on the edge of your seat bc u know somethings coming. This is one of my favorite shows. Please renew it for a third season. I love Greenleaf! Please bring it back as soon as possible. DONT LET THIS SHOW DIE UNLESS YOU THINK YOU HAVE SOMETHING BETTER TO REPLACE IT WITH. I REALLY THINK THIS IS GOOD.